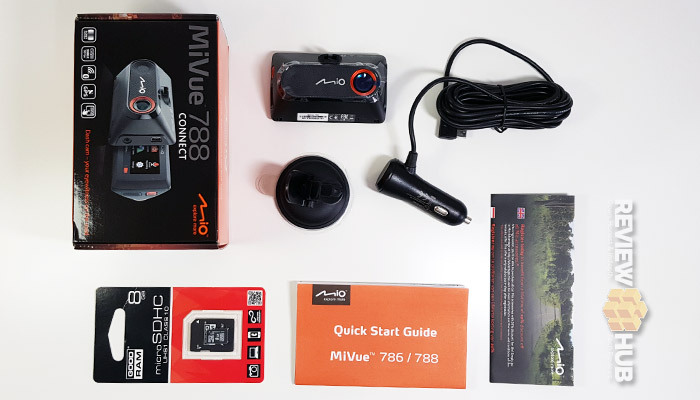 With the dash cam market being saturated with budget options, can the MiVue 788 really be worth that high price tag? Well, it does have a few tricks up its sleeve, or rather a boat load of software features that you won’t find in a budget cam. For starters, you get GPS tracking, speed camera warnings, Stop & Go traffic light alerts and a useful headlight reminder. And we’re also treated to Eco Mode and the option to add a reverse camera to record any incidents in front or behind your car. Don’t worry if you don’t know what all these features do as I’ll be explaining them later on in this hands-on MiVue 788 review. To test this dash cam, I’ve been using it in my trusty Honda Jazz for the last 4 weeks. Taking detailed notes on how easy the setup is, the video quality, the features and the connectivity. Setting up the Mio MiVue 788 couldn’t be simpler. There’s an SD card in the box, so all you need to do is attach the camera to the mount then fasten the suction cup to your windscreen. Mounting is very easy, thanks to the flip paddle suction cup. You press the mount against the glass on your windscreen then flip the paddle down for a secure hold. The internal battery on the MiVue 788 won’t keep the camera on, so you’ll need to attach the included mini-USB car charger and turn your engine on before you can access the settings. This does mean that if your car engine loses power the camera will stop recording. Now you’re all set up, you can admire the bright 2.7-inch display which is easy to see at night and in bright sunlight. The handy quick start buttons in each corner take you to the menu, safety cam, camera and emergency recording. 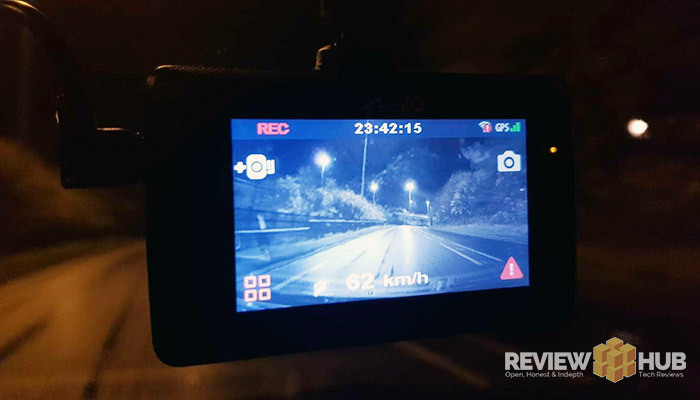 The dash cam starts recording automatically when it receives power, so once it’s set up there’s no need to press anything and you’re ready to go. The video quality is clear and crisp whether you’re driving at night or in the day. But don’t take my word for it, check out my Mio MiVue 788 Dash cam footage below. The dash camera also works surprisingly well in direct sunlight, not suffering from overexposure with the road still being visible. 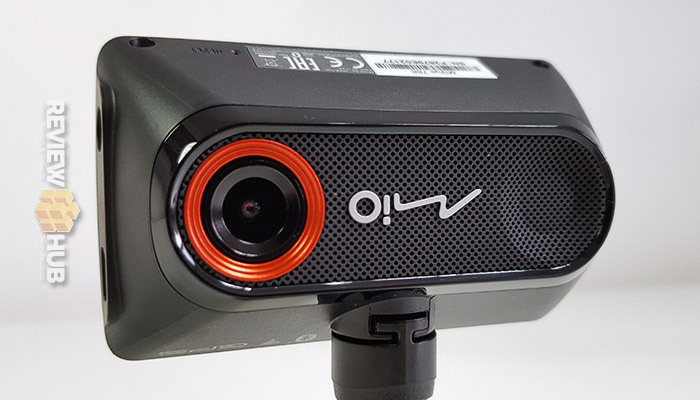 The Mio MiVue 788 records in a 1920×1080 resolution at 30 fps. With a lot of the competition filming at 2K and 60 fps, where does this leave the 788? Well, it’s not all bad news though as even with one record setting it still does a good job. While the 788 does feature a small amount of image stabilization, it’s still not enough to tame my shaky 15-year-old Honda Jazz. I imagine on most newer cars the footage would be very smooth. And finally, thanks to the wide angle (140-degree) camera, you can clearly see all three motorway lanes at once. The only downside is that the footage looks a little dull compared to other dash cams I’ve tested. But who cares right, its driving footage not your holiday memories. As I mentioned earlier, I’m a fan of the design throwback to Sony Ericsson’s W810i with the orange and black theme. It has a cool retro look and stands out from the other boring grey dash cams out there. It’s good to see that Mio has opted for a suction cup mount rather than a 3M adhesive. The 99.8g dash cam is easy to attach, has a strong suction and won’t leave any sticky residue on your windscreen. The build quality feels solid with the dash cam being made from a sturdy black plastic. I dropped it a few times when first mounting and it held up without any scratches or damage. Unfortunately, despite being named the Mio MiVue 788 ‘connect’ dash cam, it wasn’t the easiest dash cam to connect to. After updating the firmware and trying to connect multiple times, I eventually got the app to work. But, the app is slow and you have to download each video rather than being able to stream on your phone. Overall, it’s not the best experience for a dash cam in this price range. Advanced Driver Assistance System (ADAS) which is designed to alert the driver of any possibly dangerous driving situations. In reality, I turned it off pretty quickly as it was distracting me a lot with false alerts. Emergency Recording – This is footage that’s recorded in a separate folder which cannot be recorded over. Emergency recording is triggered by the dash camera being jolted or knocked suddenly. Or you tap the on-display emergency recording button. GPS & Speed Time Data– In the corner of your video, the MiVue 788 will add both your GPS coordinates and current speed. Both of these are very useful in the event of an incident. 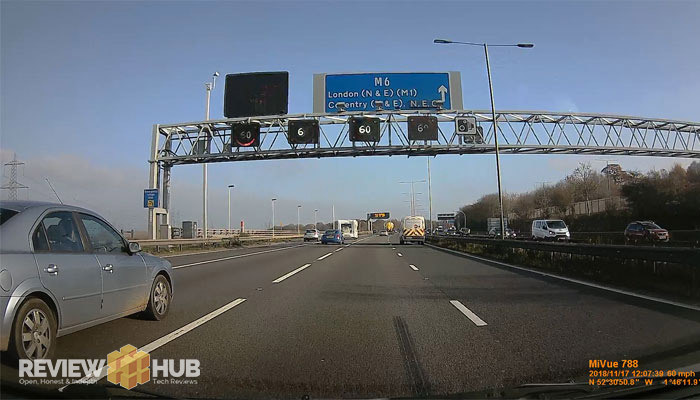 Safety Cam – This feature will alert you before approaching a speed camera with a visual and a jingle. It might even save you a speeding ticket. Mio promises monthly updates for this feature via a download. Stop & Go – This alerts you with a jingle when the traffic lights have changed. Although I’m not sure how this wizardry works, it does work all the same. Headlight Reminder – A reminder to turn your lights on at night. Eco Mode – Pretty useless feature. Shows you a leaf icon that changes from green to amber to red depending on how harshly you accelerate and brake. But in all honesty, you should have your eyes on the road. Reverse Cam – While I didn’t personally test the Mio reverse camera, having this option is a big positive. The reverse camera connects via a wire to the cam, showing a rear view live feed and recording the rear-view. 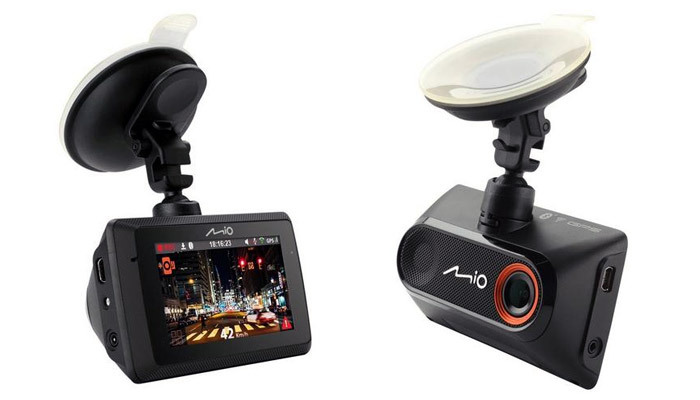 Unfortunately, the Mio MiVue 788 Dash Camera is a classic case of form over function. 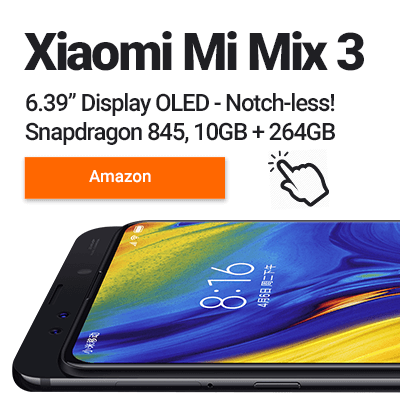 It looks the part, has an excellent colour display and mounts easily onto the windscreen, but fails when it comes to the app and connectivity. The GPS, Speed and extras such as adding a reverse camera are certainly appealing, but right now Mio need to work on their app. Hopefully, with a few software updates, we’ll be able to revisit the 788 and update this review. 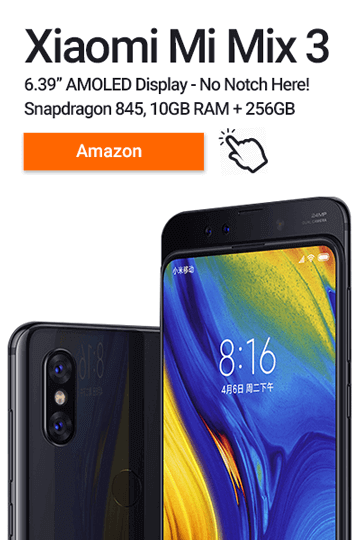 At the current price though, we can’t recommend MiVue 788 as there are competitors like the Yi Dash cam that sell for half the price with a fully functioning app.